We spent Thanksgiving in Las Vegas this year. It was also a mini Ravelo family reunion. There were about 50 extended family members who all gathered for dinner at the California Hotel (where else) and then again for a brunch on the Saturday after. It was a fun time to see Aunties, Uncles and cousins who we rarely see. We also did a little sight seeing and actually got a night out on the town with out the kids! It was a nice time but I had no luck this round when gambling. Absolutely none! I should have stuck to shopping at the outlets! The kiddos of the 3rd generation: Taylor, Rylee, Diesel, Ocean, Easton, Owen and Johnny. Cayden is missing (among others who weren't able to make it to Vegas at all) but he eventually joined the group on the Saturday for brunch. My siblings and I...we're so grown up now! Johnny and Owen at the hotel. We stayed at the Hilton Grand Vacations which is right next door to the Hilton. It's a nice place, super family friendly and very convenient since both my mom, aunt, uncle, cousins, sister and brother all stayed there too! We would bounce from room to room hanging out! 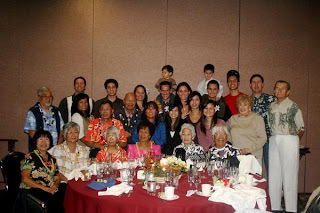 The Agapay side of the family with the "core" Ravelo family members! The Keenan's enjoying turkey dinner!